1. 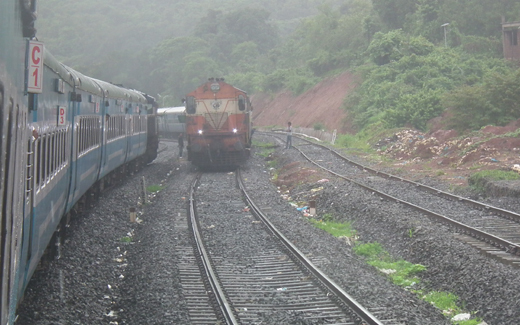 The service of Train No.22646 Thiruvananthapuram – Indore Ahalyanagari Weekly Express, which is scheduled to leave Thiruvananthapuram Central on 20th June 2015, has been cancelled. 2. The service of Train No.16317 Kanyakumari – Jammutawi Himasagar Weekly Express, scheduled to leave Kanyakumari on 19th June 2015 has been cancelled. 3. The service of Train No.12617 Ernakulam – Nizamuddin Mangala Lakshdweep Superfast, scheduled to leave Ernakulam Jn on 19th June 2015, has been diverted via Konkan Railway, Vasai Road, Vadodara Jn., Nagda Jn., Kota and Mathura Jn. 4. The service of Train No.12618 Nizamuddin – Ernakulam Mangala Lakshadweep Superfast, scheduled to leave Nizamuddin on 19th June 2015 has been diverted via Mathura Jn., Kota, Nagda Jn., Vadodara Jn., Vasai Road and Konkan Railway.